Despite many Democratic politicians distancing themselves from President Obama’s low approval ratings and declining his assistance– even in their own backyard– he’s still doing a good amount to help raise money for various groups. 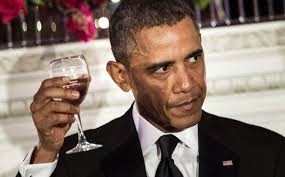 So far this year, on average, Obama is attending a fundraiser every 5 days. According to a new report, Obama has appeared at 49 fundraisers this year through September 15 — even taking the time out of his beloved vacation at Martha’s Vineyard this past August.